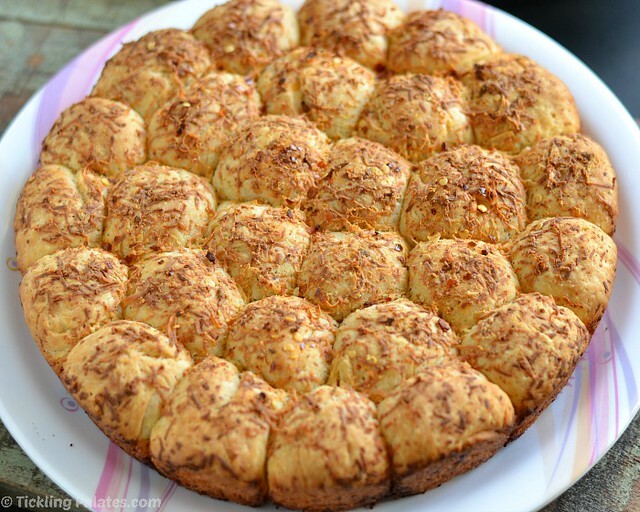 Cheesy Garlic Pull Apart Rolls Recipe. 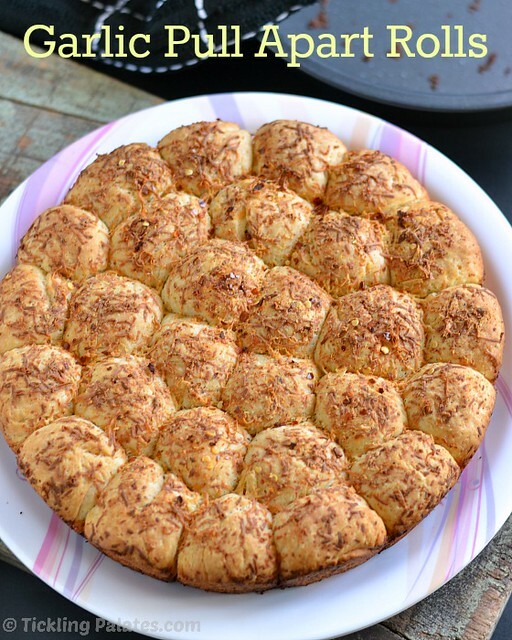 Eggless Garlic Bread pull apart rolls infused with the garlic butter, topped with cheese and baked to perfection that is just perfect for any party as an appetizer. You can have it for breakfast or dinner or serve it as an appetizer or starter or just plain comfort food at any time of the day. We are all a big fan of it at home and the kids always order in one whenever it is time for a pizza dinner. 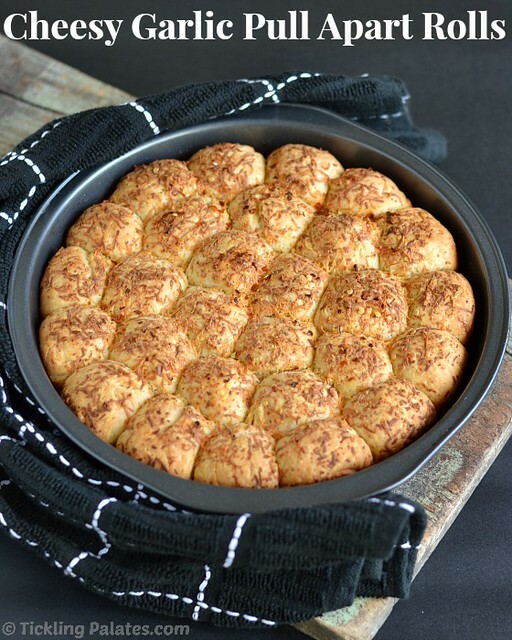 I had always wanted to bake big pull apart bread that does not involve lots of process and here is what I came up with. It is eggless bread and loaded with garlic flavor. When both the kids were home last Saturday which is very rare as the elder one always has school on Saturdays too, this is what we made and what’s more important is that we had loads of fun in both making it and polishing it off the pan dunked into some soup. I wanted the bread to be rich in flavor and texture but not exactly dripping with butter. So I halved the butter used in garlic butter and replaced it with olive oil and the below picture is what is the result of it. It still came out spongy and springy to the touch and we cleared up half of it as soon as it came out of the oven and the rest I served for dinner along with some hot soup. The best dinner one could dream of, I promise. I had been missing out on baking breads for the We knead to bake group owing to laziness and this time I pushed myself not to miss it as well. This is the one of the simplest of breads that you can bake and if you are afraid of yeast then please do not let it scare you off and let it win. 1. While making garlic butter, you can use 1/2 cup butter instead of olive oil. 2. If using Active Dry Yeast, then you need to proof it before adding to the dry ingredients. 3. Instead of using garlic pods, you can also use garlic powder but using pods gives out better flavor and taste. 4. The number of rolls will depend on the size of the balls that you make. 5. I used Cheddar cheese but you can also use any other cheese of your preference. 6. The time taken for the dough to rise or double will depend on the local humidity of the place you live. Try these bread rolls as its simple, basic and downright easy despite the long instruction. Do check out other eggless baking recipes which I’m sure you all will love. 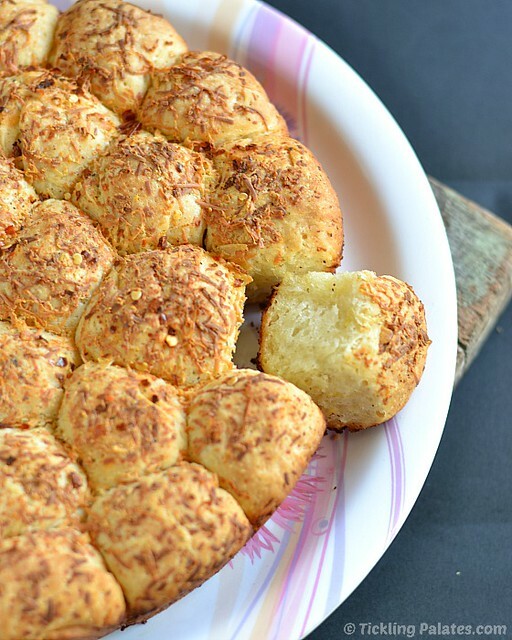 Cheesy Garlic Pull Apart Rolls which make a fantastic appetizer in any party. For the Garlic Butter: Crush the garlic pods to a coarse paste using a mortar and pestle. In a bowl melt the butter and olive oil together over low flame. Add the crushed garlic, Italian seasoning, salt and let it steep well for at least an hour. For the Bread Dough: In a mixing bowl, mix together flour, instant yeast, sugar, salt. Add softened butter and rub with your finger tips till the mixture resembles like bread crumbs. Heat the water till lukewarm. I microwaved at high for 1 minute and that heat would be perfect. Make a well in the center and add the water. Smear oil all over the dough and keep it covered in a bowl. Make small ping-pong sized balls from the dough. Make sure that the balls are even in size and keep aside. For the Pull Apart Rolls: To the Garlic butter, add 1/2 the quantity of grated cheese and mix well. Add the dough balls to this butter and mix gently with your finger tips till all the balls are coated evenly with the garlic butter. Take a 9 inch round pan and grease it well. Arrange the balls all around the pan. Pour the remaining garlic butter mixture all over the arranged balls. Cover the pan with a lid and let it rise for 1 more hour. I inverted a big dinner plate over the pan and my rolls took just 30 mins to double up in size. Baking the Pull Apart Rolls: Preheat the oven 190 C or 375 F.
Sprinkle remaining 1/2 cup of grated cheese on top of the rolls evenly. Sprinkle chili flakes on top, if using. Bake for 25 to 30 mins or till the bread looks golden brown on top. Cheesy Garlic Pull Apart Rolls are ready. Let the pan sit at room temperature for it cool down for 5 mins. Invert the pan on to a plate. Serve warm with any hot soup of your choice. Pull apart Bread Looks so inviting and u made this dish to perfection. Awesome Photography. 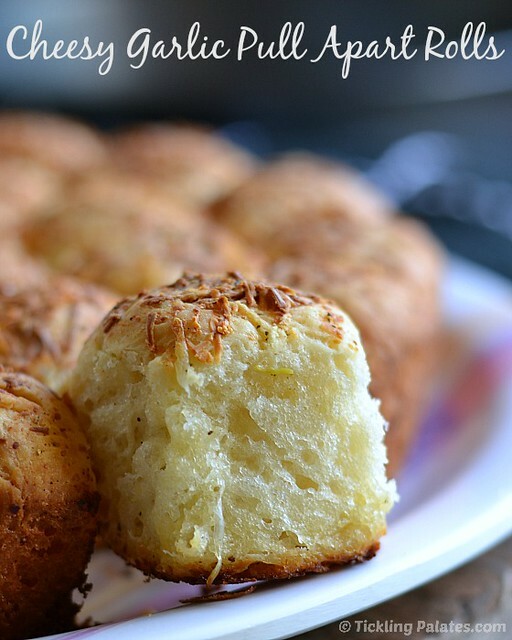 Soft looking pull apart rolls,looks fabulous and perfectly made,awesome clicks..
Looks fantastic and perfect.. Loved the clicks..
beautiful recipe, well explained and such awesome clicks, cannot decide which is more delicious, the bread or the clicks! !definitely you have tempted me to bake..
1 cup of water is around 250 ml right..?? then why does the recipe shows 150 ml..? I used a teacup hence the measurement. If the flour is old or aged it might need more water. Thanks for the recipe, I have made this two days in a row for a bbq and everyone loved it. It was nice and soft and the kitchen smelt great. Welcome Nisha. Thank you for the feedback. Its downright addictive and moreover smells and tastes great. Keep visiting. Can this be made in a microwave? If so, how long would it take? You can bake in the Microwave only if you have convection mode Pooja. Else you cannot make it in ordinary microwave mode. I tried this recepie it was so awesomely yummy had it with a carrot and mint soup…delicous …my very first bread it was awesome !!!! Thank you so much for your lovely feedback Benna. I’m so happy that your very first bread turned out good for you. Keep visiting. Thank you for trying and giving a lovely feedback Rekha. I have used Instant yeast, so did not proof it but I have clearly mentioned in the post that if using active dry yeast, you need to proof it before using. Which type of yeast did you use?